So I'm still working on figuring out this photo of the three Swenson girls and my mom, Janice Burrell. 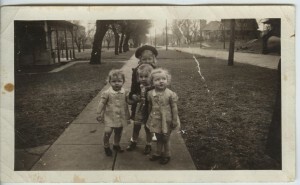 Mom assures me that her cousin Jane looks more like her older sister (Beverly, in back), than like her twin, so Jane is on the right and Joan is on the left. The next question is where was this photo taken? At first I thought the building in the very far left might be Phillips Middle School - once known at the High School. But that street is not Fifth Avenue North. It does look like a school, however. So, I went to the Webster County Historical Society and Webster County Genealogical Society and talked with people at both locations. After looking through city directors (1940, 1941 and 1944), looking at maps and photos of defunct schools in Fort Dodge, I still hadn't figured out my mystery. And the city directory was partly to blame. 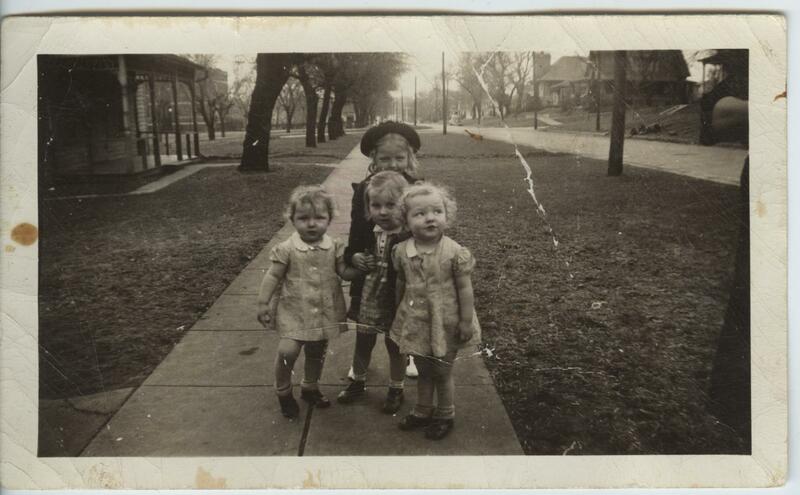 The address for the Swenson family in 1940 was 216 Park Boulevard. The problem is, there is no Park Boulevard in Fort Dodge. I looked at old maps, at Google maps, at the aforementioned photos and still couldn't figure it out. When I was talking to Sue at the Genealogical Society, though, somehow something clicked. I checked the 1940 city directory again, but this time I looked at the reverse listing - by street. I found Park Boulevard. There was a note that said the street was renamed from 17th Street (North 17th or South 17th, depending on location in relation to Central Avenue. Therefore, the address was 216 South 17th Street in today's terms. And at that time (around 1941, I'm guessing), the old Arey School would still have been standing. I didn't find any photos of that school, but there must be some somewhere. And I haven't driven down the street yet to see if the rest of the details match. But, I am excited to have figured this out (assuming I'm correct). those "ah-ha" moments are always nice. I managed to get my external hard drive hooked up tonight and went looking through the files for some photos I could use for a speed scrap on Facebook with MyMemories. They do that every Sunday night (and other times). But in the process, I discovered some old photos that I honestly didn't know that I had. They must have come from my mom's cousin, Jack Webb. I used four of the photos for my layout and found a plug-in for WordPress that does photo galleries. So you can view the photos here. It's a page called Burrell photos. There are 113 photos in the slideshow. I already had a very few of them, and the one called Easter girls is one that Jack doesn't have. The girls pictured are my sister Donna, me, and our cousin Neela, all dressed up in identical Easter dresses. I am excited to see the photos - I don't think I had ever looked at them all before. The house in many of the photos is probably the house that Walter and Augusta Burrell (my mom's paternal grandparents) lived in, in Fort Dodge. The house is gone now, but I know where it was located. Someday I'll go down that street and compare the photos to the other houses to verify it. And this one wasn't scanned at that point but is now (April 25, 2012) - A photo of my mom, Janice Burrell, in the center, surrounded by her Swenson cousins: Jane, Joan and Beverly (in the back). To be honest, I'm not sure which is Jane and which is Joan, but I can tell them apart now. (The first part of this is modified from a Facebook post.) Johanna Cornilsen married Heinrich Muhs and had two children: Walter and Frieda. Frieda married Henry Korn and had Arthur and Florence, and Florence married Arthur Burrell, had three kids, one of whom was my mother, Janice Burrell Snyder. Walter and Frieda both got married on 11 April 1917, BTW. And I think Johanna went by Hannah. I think she married again after Heinrich (Henry) died - Anton Dengg? I'll have to look again. Mom told a somewhat amusing story about attending a wedding (possibly Hannah and Anton) when she was about 3 and getting drunk from the glasses of beer left around by the adults. Notes about this family: On Florence Korn's birth certificate, her mother's name is listed as Frieda Ninho instead of Frieda Muhs. Her name was kind of scrawled, so I can see how the indexer(s) got it wrong, but I wish it could be corrected. When I'm indexing sometimes I just put my best guess and hope that the arbitrator catches it ... but obviously that doesn't always work. I took Mom to a doctor appointment today, and during the time the nurse was there, we were talking about random stuff and somehow the conversation brought back memories for Mom. I'll try to recreate some of what she said: When she was a little girl, at one point her family lived in a four-flat in Chicago owned by her maternal grandparents, Henry and Frieda Korn. They also lived in the building, as well as Arthur and Shirley Korn and their kids. Arthur was Henry and Frieda's son, their daughter was Florence, married to Arthur Burrell. Henry and Frieda owned a small grocery store. They would let their kids know when they got butter in, as it was during World War II and butter was hard to get. Mom got to go to the movies - I think she said her grandmother took her. Once she saw an Abbot and Costello movie. Abbott was in the hotel bathroom shaving. Costello was sitting on the bed. A zombie would come out of a sliding door in the wall. Costello would sputter and try to get Abbott's attention, but when Abbott came out of the bathroom, the zombie was gone. Mom then had to try to go to sleep, and her bed was against the wall. She was sure a zombie was going to come out of the wall and get her. She also mentioned that her mom didn't like some of the jobs her dad had. He worked for the railroad in Chicago, and was at one time a street car conductor. For the railroad, he would redirect trains when troop trains would come through. She didn't know for sure why the family moved to Fort Dodge when she was a kid, but it could have been related to her mom not liking Grandpa Burrell's jobs. Grandma Burrell did like one job that Grandpa had - as a chauffeur. I guess he worked for a private employer, and once they went to Virginia and Grandma got to go along. Grandpa paid half of his motel bill to cover her. Mom also mentioned that she worked in her grandparents' grocery store and got to read the comics for free. She mentioned something about her cousin Johnny Korn, but I can't remember what it was. We discussed that this was the same cousin who skinned his knee and had to have a bandaid, and went limping around. Then the bandaid fell off, he put it on the other knee and limped on that leg. Much of what we talked about was all new to me. I need to start doing interviews with Mom to get her memories. I was recently chastised by a person who had asked me to perform a certain task. He had told me that the person for whom the task was required would be busy that week, so I put off calling. Later he was upset that I hadn't called, even though the recipient was busy. He was also upset that I hadn't brought a third person along who needed to work on the task as well. I objected to having to worry about the third person's participation. I felt I would be doing well to get myself there and do what I needed to do, and didn't (and still don't) want to have to deal with the third person's schedule or plans. For one thing, I have two days off a week - if the third person can't participate on those two days, then it won't work for me. So I got an earful on the phone. I was told that wanting to only arrange my own schedule was a "weak excuse" and I needed to do better. It didn't help that the call came on my cell phone while I was at work and I had to deal with being yelled at (chastised in a loud voice) at work on an already stressful day. But the real problem here is the memories that it brought back. It was exactly like many of the confrontations with my dad growing up. I was never good enough. Nothing I did was ever good enough. Even if I did what he wanted, it wasn't how he wanted it, or not soon enough, or whatever. So, this conversation brought back memories of pain that I've tried to get past, mostly by trying to forget them and by trying to tell myself that if I can't please my dad, I need to forget what he wants and quit trying. I can't live up to his standards - I have to live up to my own. I guess you can't really leave your past behind - it keeps catching up with you. I often use the phrase "a vague recollection" when describing a memory. When I'm remembering things, I'm not entirely sure that I'm describing an event accurately. Our memories can be tainted by time, or by discussing an event with someone. More than one event can be merged, so that you may describe something that happened as a single occasion, when in reality, some time had passed. As an example: I remember seeing a light between the baseboard and the wall of my room. This crack grew bigger while I was lying in my bed, to the point where I could see down inside and see tiny people there. Obviously, this was a dream, but it's as real to me as actual memories. Hence the name: a vague recollection. My purpose here is to document these memories - for me and for others. Eventually I hope to have family history oral interviews on video to share.